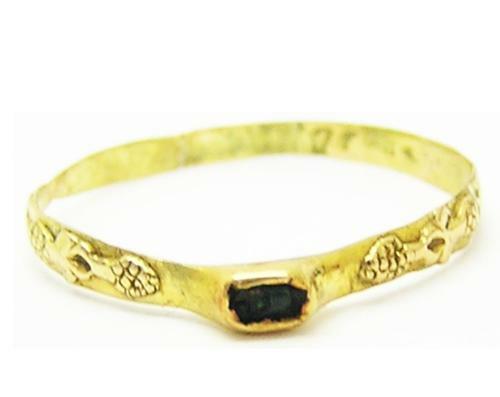 This is a charming medieval gold finger ring, dating to the 13th century. The ring is set with the original emerald green gemstone (possibly glass). Interestingly this ring has decorated shoulders, it appears to be a lovers knot between two pinecones (or a representation of a heart). The bezel is slender and shaped like a stirrup, the band very dainty. A comparable stirrup ring (without the decoration) has been recorded from Kent KENT-68B2B7, Colchester ESS-831C60 and ESS-98F924. Being a ground found example, this ring has been cleaned and straightened, it has an old repair to the band (likely once resized). A nice and delicate medieval ring, suitable for wear with care. DATE: c. 1200 - 1300 A.D.
PROVENANCE: Ex. private collection in Nottinghamshire.